Erik grew up in rural New Hampshire and shortly after his teenage punk rock phase, mellowed out and become his crunchy, bleeding-heart self with intent on saving the world. Erik attended Keene State College to earn a B.S. and B.A. in Secondary Education and Social Science, respectively. When not in class, Erik played drums in a Phish cover band. While student teaching, Erik realized he preferred to save the world in other ways. 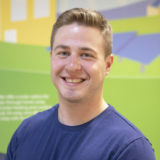 Since graduating college in 2012, Erik worked in the non-profit human services sector, including roles with AmeriCorps VISTA in Manchester N.H. and the United Ways of VT 2-1-1 program. Erik’s family – his girlfriend Kristen, dog Rigby and cat Stinky – moved to Burlington in 2014. Erik is thrilled to help Vermonters go solar at SunCommon.